In other news, my first day back wasn't anything special aside from the pure thrill of seeing Varen again. I left with the mistaken idea that we would have occasional sms contact (every 2 days or once a day at the most). My expectations while away were quickly proven naive and we generally had very regular sms contact thruout (I wouldn't go so far as to suggest it was as much as an sms an hour, but it was way more than one a day!). But even with the regular smsing and my daily notes from him (will explain this in the 01 August post to follow), I still missed him far more than expected and we have barely left each other's side except for work and the occasional visit to the loo since my return. On Sunday, after a fabulous breakfast at Doppio Zero, we went back to my place and I did masses of washing and unpacked my bag and sorted thru gifts and what not. That afternoon was slept for a while - only got to bed around 3am on Sunday morning after the whole airport thing (arriving just before midnight) and then the excitement of gift-giving (I gave him a Masai-head dagger), a much needed (on my part) hot bath and then the general conversational catch-up and just reveling in being in each other's company ... it all adds up and makes for a very late night. So the afternoon nap was much deserved! Then we went to fulfill two of my "return requests": Pizza from El Capo and Moulin Rouge on dvd. Moulin Rouge! is a 2001 Academy Award-winning Australian jukebox musical film directed by Baz Luhrmann. It tells the story of a young British poet/writer, Christian, who falls in love with the star of the Moulin Rouge cabaret actress and courtesan, Satine. It uses the colourful musical setting of the Montmartre Quarter of Paris, France. 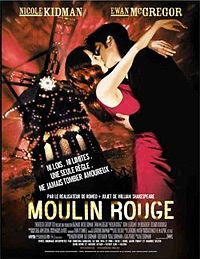 All there really is to say about Moulin Rouge is: I love that movie! It was a good day. Last night we did a giant shop at Woolies for work lunches and dinner for tonight & tomorrow - admin type stuff. And then we had sushi for dinner with Loulou (another of my return requests).